My momma always taught me not to lie. I don't think this is a lie though as much as it is a change of heart. Remember in my last post where I said this is my last Valentine cupcake painting for this year......well I just never know when my mind will take a completely different direction as I put my brush in my hand. It all started when I took a short trip to Hobby Lobby after leaving the doctor's office. I came across some cute harlequin ribbon and made my purchase along with a few other cute items that were 50 percent off. After taking down all my Christmas decorations, I needed something to put on the shelf above my kitchen stove. ....and I found this cute pillow for about $4.00 for my new computer chair. I listed this one last night on eBay. This very rich dark chocolate fudge cupcake is topped with fluffy white frosting. Tiny red hearts are an extra little touch and a red, "I ♥ You" ribbon is tied around the base of the cupcake. A small white heart hangs from the red ribbon with the word "Cupcake" in the center. 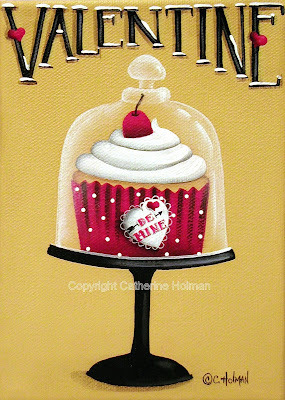 So, when read all together you are saying to your sweet Valentine, "I ♥ You Cupcake"! 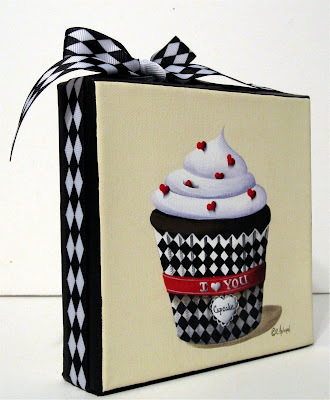 A black and white harlequin grosgrain ribbon is wrapped around the edges of the canvas and tied in a bow at the top. Doesn't it look cute on my shelf in the kitchen along with my other purchases? I may have to paint one for myself! If you are looking for a gift for that special someone for Valentine's Day the following two prints are available in both my eBay and Etsy Stores. Cathie, I love the cupcakes. I remember that one from last year! I love the tea and cookie canisters too! 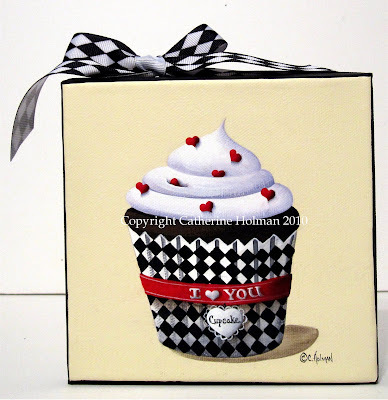 I do love your new cupcake hanging above your shelf-I think a painting for you is in order! Enjoy! Thats so cute! I love it where you have it too.Nice! Catherine, it sooo belongs there! Too cute. I'm glad that you were paying attention to that little voice. Oh my goodness, you have done it again! how cute is this cupcake. I love it. You are so creative its amazing to me. I love the Polka- dot- letters above the "be mine"- Cupcake. OH SO CUTE! Love, love, love the harlequin! 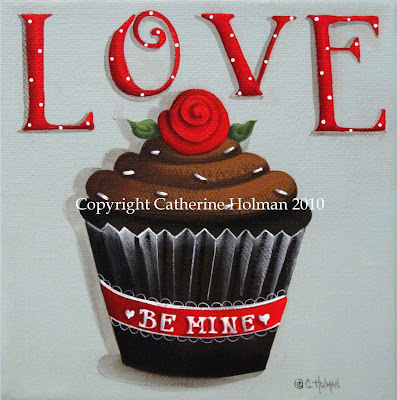 Cathie - my mouth is watering for cupcakes right now after looking at all your beautiful paintings! I'm headed to the grocery store to make some now!! !